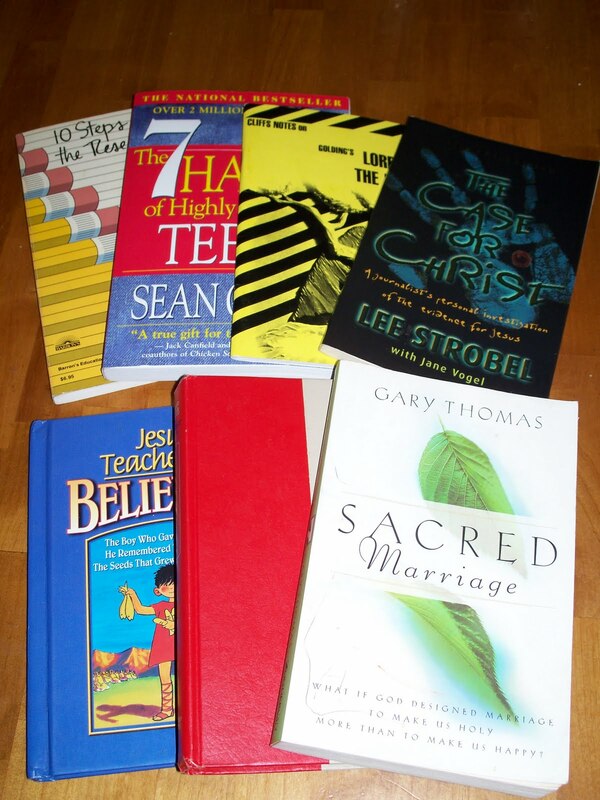 I'm really anxious to start reading Sacred Marriage by Gary Thomas . The little bit I read while nursing Miles in the van was very good and thought-provoking. We have The Seven Habits of Highly Effective Families by Stephen Covey , so when I saw The Seven Habits for Highly Effective Teens by his son, Sean Covey, I knew it needed to be on Mason's high school reading list. He snatched 20,000 Leagues Under the Sea because he loves old hardback books. 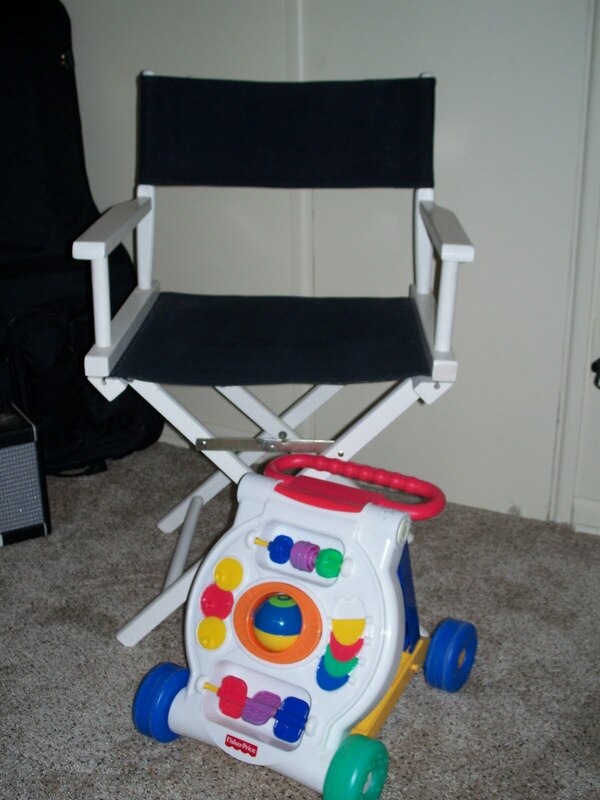 As soon as I saw the director's chair, I grabbed it. It's in very good condition and was only $6. It went straight to my teen's room. The walker is for M2, of course, because he is determined to be walking much too early. Clothes for Miles, who is growing way too quickly. 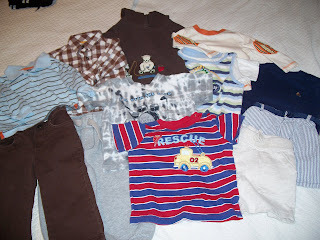 You would think that having five boys would mean plenty of hand-me-downs for the baby, but I actually had to start from scratch because I didn't have anything under size 2T. God surprised us with one more blessing after I gave away all of my baby clothes. 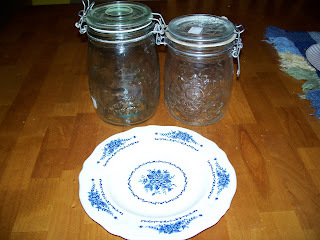 I am going for an eclectic French country kind of look in my kitchen. Our "new" house is 54 years old and we're only the second family to live here. The original owner never updated so we are remodeling and I get to make it just how I want it. I'm so excited! It will be new but I don't want it to look too new. Know what I mean? I want something that looks inviting and cozy, kind of like my Grandmas's kitchen, only without the metal cabinets and green linoleum. Do you have a post about your special treasure hunt finds? Leave a comment with a link to your blog or just tell us about it. Happy Hunting! It is a well-known fact that young children, especially boys, need to move, run, jump, and climb. They need to explore and conquer something, anything, everything. All of my boys have been very active, so much so that my mother (who only had one introverted girl) used to ask me if I thought my son was "hyper". 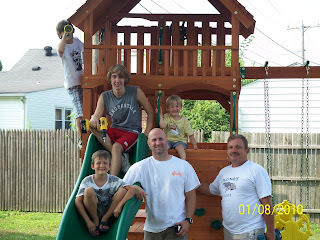 She asked that with each one until I had our fourth son because by that time, she had finally figured out that they were just being "normal" little boys. She regularly comments about how I must have "nerves of steel". Haha. No, I have just been conditioned over the past 16 years and have become more relaxed around all of their energy and rowdiness or able to tune most of it out. Over the years, all of my boys have literally climbed the walls in narrow hallways and doorways. They have also climbed the counters, furniture, stairs, shelves, storage sheds, and trees. 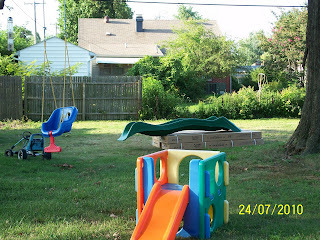 So, we knew that when we moved into a new house we really wanted to have a climbing structure of some kind. Enter Grandma and Grandpa. They love to buy things for the boys so we suggested that this would be a worthy investment. The boys and I had our eyes on the Highlander at Sam's Club. 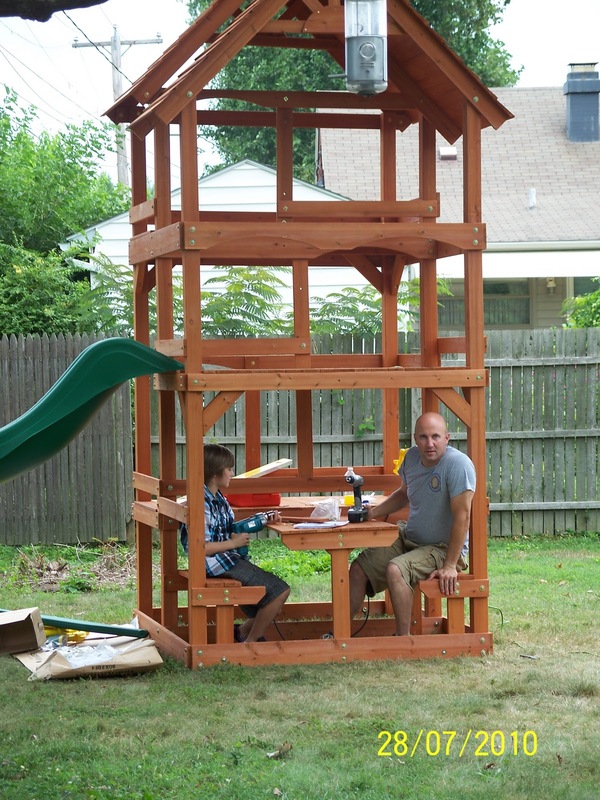 Three levels, covered, slide, swings, seesaw, rock wall, picnic table, made of cedar. Yes, they needed that. The perfect spot. Visible from the kitchen window over the sink and the back door. NG put together the picnic table, then Dad showed up. Every one of those hands were busy building the Highlander. Over the course of a week, the total time spent putting it together was about 20 hours! Needless to say, no one wants to build another one any time soon so it needs to last at least 10 years. Of course, if we continue to have the whole neighborhood show up, it may not. Yesterday, there were 16 kids in our backyard playing on it, playing soccer, and running around. And only 2 were mine. Now that we are a family of seven with one income, it is even more important to stretch our dollars. Food is our biggest expense, next to our mortgage, and eating natural, whole foods is more economical in certain categories yet more expensive in others. By avoiding overly processed, convenience foods and making more foods from scratch, I save money. For example, soaking dry beans for soup or making homemade muffins or bread. But there are certain things that I buy on a regular basis that cost more, such as organic milk or yogurt, free-range eggs, and some organics. Money can be saved at the grocery store by choosing store brands over national brands for certain items, like dry beans, canned goods, and frozen veggies or fruits. Some stores even carry their own organic lines, like Kroger's Private Selection Organics. The prices are very close to national non-organic brands most of the time. Another example from Kroger's is their customer-specific coupons. They track your purchases when you use your shopper's card and then mail out coupons for items that you buy regularly. You can also go to their website and load electronic coupons onto your card, but they tend to be for convenience or snack foods. Kroger's also doubles manufacturers' coupons up to 50 cents, so locating coupons for organic products can help out significantly. For a variety of coupons that change periodically, check out Mambo Sprouts, where you'll also find recipes, reviews, and contests, The Natural Food List, and the Grocery Coupon Guide, with a list of links to natural food manufacturers. Some ways to save money on fruits and vegetables are to grow your own, find a generous neighbor with an over-producing garden, or buy local and in-season from your farmers' market and orchards. Talk to the vendors to see if they use any chemicals. They may not be certified organic, but may be grown without pesticides and other chemicals. 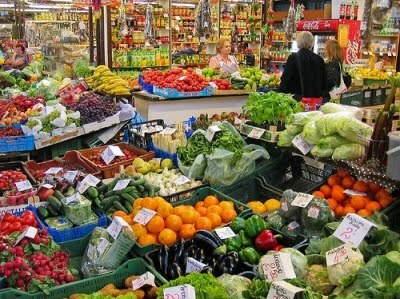 You can find your nearest farmers' market here. Other related options for cutting costs is to purchase a side of beef (grass-fed) or find a source for free-range chickens and/or eggs. I'm still working on finding local sources for my last suggestions. We don't have an extra freezer, so the beef is not a possibility right now. Eating healthy can seem to be more expensive at first but it will most likely end up costing less over your lifetime. Consider that eating natural, whole foods will support a healthy immune system, reducing illnesses and chronic conditions, help maintain a healthy weight, and therefore, reducing doctor visits and lost work days. Update: You can find more ways to save money at Saving Naturally. I found this recipe on Food.com and we all love it. If there is any left over after dinner, it definitely gets eaten for a before bed snack or next day's lunch. My husband says the flavor reminds him of his late grandmother's vegetable soup, which is a good thing because I have tried unsuccessfully to duplicate it with my own vegetable beef soup. Saute onion, garlic and chilies in olive oil in large pot until soft. Add rest of ingredients to pot and bring to a boil. After about 20 minutes, remove chicken, shred with two forks, and return to pot; simmer for 45 minutes more. Serve with tortilla chips, sour cream or plain yogurt, and shredded cheese. Skip sauteing and put everything in crockpot (except olive oil). Cook on low for 6-8 hours or high for 4-6 hours. Shred chicken and stir into soup before serving. Make your own chicken stock using a whole fryer and debone the chicken. Takes longer but you end up with a more nutritious and delicious soup. Labor n. Physical or mental exertion, particularly for some useful or desired end; toil; work. -- v.i. To suffer the pains of childbirth; be in travail. To date, I have had two medicated births and three natural births. There is definitely a difference during and after for mother and baby. What I learned from experience and research is that how you think about labor and birth will largely determine the outcome. If you listen to every birth horror story and believe the drama you see on television, then you will probably be filled with anxiety and fear when you think about your little one's impending birthday. Most women in our culture have been led to believe that childbirth is something horrible and is best managed with drugs. Although you will experience pain during labor, it can be more easily handled if you are prepared for the stages and understand what your body is doing at those times. Fear and anxiety will increase your level of pain by working against your own body. Your body was designed for carrying and giving birth to babies. Women all over the world have been having babies for thousands of years and most have done it without medication. They have relied on the wisdom and teaching of other women who have had experience in giving birth and have learned to be aware of the natural rhythms of their bodies during labor. Having confidence in your body's ability and being mentally prepared will help you to have a more positive birth experience. That being said, there are no guarantees that you will have the birth you planned. Complications can arise on occasion and when they do, it is a blessing to have trained professionals available to help. But by being informed, you can be aware of your options and make informed decisions about the situation. There is a lot to be covered regarding natural childbirth, so much that I couldn't do it justice in a short blog post. So I'll just give you some places to start for your own research. And I'll leave you with my favorite advice: Be informed, be informed, be informed. Trust your God-given motherly instincts. Ignore negative comments and stories from people who have never had a natural birth. And remember that "birth is a natural process, not a medical procedure."